Crime Scene, 2007: The disjointed rear wings of this many-winged house required a garden to “tie” them together. The music room wing (interior pictures here) is on the right, and the old kitchen wing, or “north wing,” is on the left. Wanna live in a sprawling 19th century mansion? Do what we did, and buy — for a shockingly-low price — a glorious wreck of a house in a depressed neighborhood. You won’t have many closets. But you will have a stunning staircase, and lots of elegant fireplaces. If you are lucky, the house will harbor lots of ghosts. And here’s the best part: You’ll have the satisfaction of knowing that you saved a piece of local history. Now back to our lawn-to-lettuce love story. The Herb Garden’s basic elements — 4 raised beds, wire-mesh fencing, pressure-treated fence posts, 2 gates, and pea-gravel paths — set me back not more than $100. The beds are framed with common pine. The garden’s focal point, an antique cast-iron urn, cost $20 at auction. It makes a nice setting for ‘Callie,’ a lavender-blue Calibrachoa. The plant blooms and blooms, and it does not require deadheading. Deadheading is not my idea of a good time. I’d rather sip a martini, and dream up more ways to live rich, even though I’m not. The plain-white music room wall made a dreadfully boring backdrop for the garden. Consequently, I gave it some architectural interest. Stained glass windows were my first choice. More affordable was a trio of black metal trellises, acquired from Lowe’s for $10 a piece. I attached them to the wall in a triangular fashion. 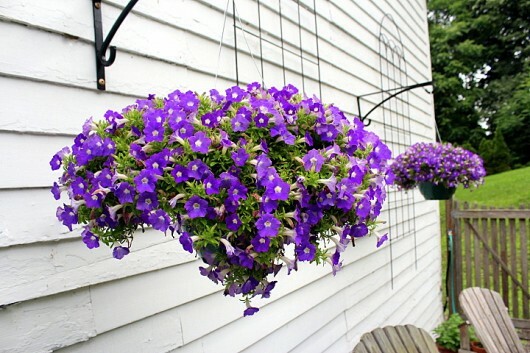 And for further architectural interest, I recently nabbed a pair of Supertunias in big hanging baskets, and suspended them from brackets attached to the music room wall. Supertunias flower with shameless exuberance. They smell nice, too. 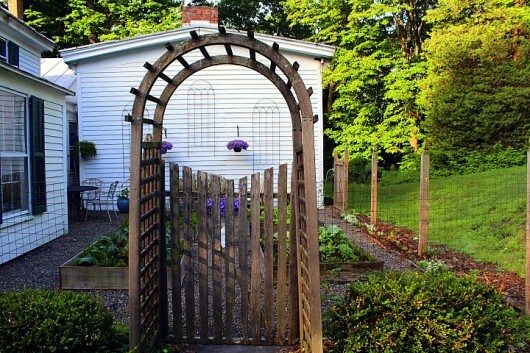 Since arches make graceful entrance-ways, I marked the main gate with an arched cedar arbor. Although the piece during summer was priced at $235.00, I bought it at the end of the growing season for just $50.00. Tip: If you’d like to find high-quality garden-furnishings at rock-bottom prices, be sure to visit your garden center or “odd lot” shop in September. These stores are making room for winter inventory then, so patio furniture, arbors, and the like are usually steeply discounted. Bed #1: Romaine lettuce, and green and red oak-leaf lettuce. 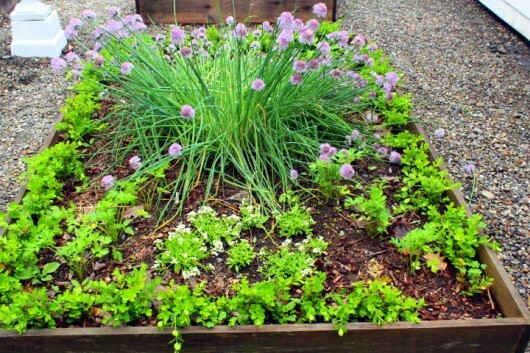 Bed #2: Common chives, white aslyssum, and flat-leaved parsley. I’ll cut the chives back later today, and turn them into this incredible pesto. Bed #3: Kohlrabi and basil. In the foreground are green beans which have not yet sprouted. 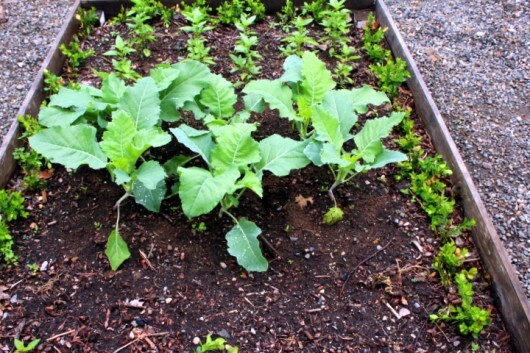 Bed #4: Savoy and red cabbage. Both types are delicious for roasting. Oh. All of the beds are edged with tiny boxwood shrubs, obtained (for free!) from simple cuttings. 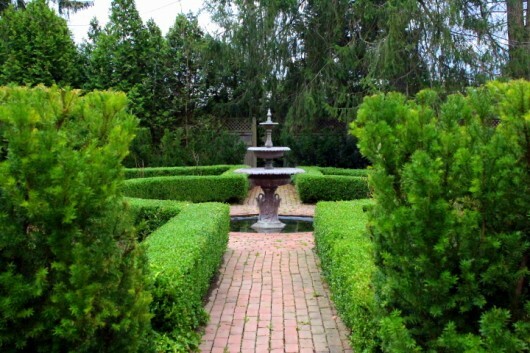 Boxwood cuttings are how I created yet another elegant but low-cost garden on this property. Click here for details. In closing, I’d like to remind you that garden beauty needn’t cost you an arm and a leg. And to make my life worth living, be sure to post a comment below. I truly enjoy your posts on your home and what you are cooking. My family enjoyed the spinach strata last night and my husband does not yet believe your advice on vinegar and weeds. Hi Lee — So glad you enjoyed the Spinach Strata. I made it again for a Sunday brunch, and it was a BIG hit! You have a great vision! I love it all & thanks for sharing your frugal ideas that look like so much more! Hi Manette Gutterman – Thanks for joining me on this little walk-about! Thank you so much for the walk through your kitchen garden Kevin. I’ve pinned the pictures so that I can refer back to them. We have a blank wall that’s been bothering me and I love what you’ve done. Thank you also for letting us know that you used pea gravel-gravel for the paths and where you got the trellises. It’s all very inspiring. I’m very interested in the chive pesto. You painted the urn! I sort of liked it rusty, but the paint will preserve it from rusting all the way through. You nab some incredible bargains and use them beautifully. The plants are the real stars, but the accoutrements really set the stage for them. Your vision and dedication to beauty are inspiring. Susan Knerr – Definitely try the Chive Pesto. It’s addictive. Hi Mary in Iowa – You are right — I like to create a “stage” for plants! I love this! I am thinking that I may have to make part of our veggie garden into an herb garden retreat. LOL! In theatre we’d call what you do “set dressing”, Kevin. Your ideas are amazing! I will follow many tips including the auction for planters and end of season sales! Thanks for this great web site and your blog! Thanks to you I have tripled our box hedges. Little corner of blueberry pie! I so enjoy post, have followed many of your ideas, from gardens to cooking, I love both keep it coming. Love the post! Your garden looks amazing! Hello Kevin. I’m fairly new to your blog. I made the chive vinegar and just today strained out the chive flowers. I’m looking forward to trying in in a potato salad recipe. The chive pesto sounds good also- thanks! I imagine you would like this recipe on a cracker- finely cut up fresh rosemary into some feta cheese and add a bit of olive oil. Stir until it mingles together nicely and adjust the amounts according to your taste. Yum!! Here’s another cheap way to make your garden look elegant: Dress up cheap plastic pots (even the ones that plants come in from the nursery) with Rustoleum Hammered spray paint. It dries with a wrought iron effect that looks pretty darn classy. They make a version that adheres right to plastic so you don’t need to primer. I have even used it on cheap plastic outdoor side tables to make them blend in with my wrought iron furniture. And…I have to second the recommendation to make the chive pesto. It is so delicious on crackers. 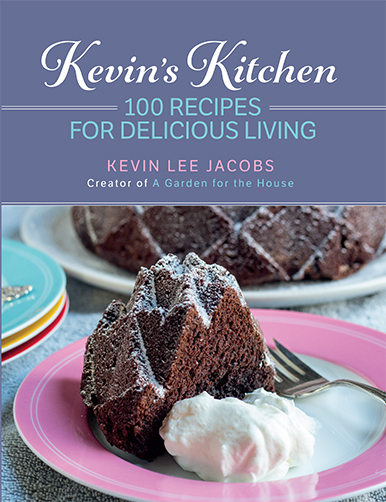 Kevin, I really enjoy all your recipes, home and garden tips, etc. shared with your fun sense of humor! I love the look of the little boxwood cuttings around the edge of your raised beds, but what do you do with all of them when they get too big for that space? I know you said that in the past you’ve used them to start hedges in your other garden areas. Are you continuing to do that, or what? Just saying good Sunday morning and thanks for your lovely posts. Beautiful work. Love your tours and recipes. I love your website, thanks for sharing your beauty. Bravo Kevin! It’s time I make some cuttings from my boxwoods- you inspire me! Question for you — do you find that your chives want to take over the bed? When we lived in Maine, the one chive plant I’d put in a pot came back year after year and virtually took over everything else (including jumping both to other pots and to the surrounding ground), but the similar one chive plant I’ve put in a pot out here in Utah has stayed one modestly-sized plant, when in fact I’d love for it to spread out and expand. Have you had any trouble keeping yours corralled? LOVE not only seeing what you’re doing in your garden(s) but also love hearing the nuts-and-bolts of making them, and even how much things cost. Definitely a huge help! I think your herb garden is beautiful! I love when a yard gets totally reformed to be not only something you will be using for your food but the beauty as well. I have worked in my back yard for years to try and make it look nice and it dies look better since the day we bought our house, it’s just not completely like I want it. So still trying to get more done on it. Thank you for the pics of yours! You have a creative mind, bless you for the simple and awesome ideas for people to be inspired. I love to put an idea to paper and create a space and you do too. To me to see what you do is a piece of heaven. Thank you, thank you. Hi, Kevin — How strange, I just wrote out a long comment and “posted” it, but it vanished. Okay, we’ll try again. First, thanks as always for the inspiration! Quick question for you — do you have any issues with the chives wanting to take over the whole bed? When we lived in Maine, the one chive plant I’d put in a pot came back year-after-year, getting “bigger” every year, eventually taking over the other pots and even the surrounding ground. But the same one plant that I’ve put in a pot here in Utah is, after several years, still just one same-sized plant. I’d actually love it (since I use a lot of chives) if it would spread its wings a bit. What’s been your experience — do you have any trouble corralling your chives? And thanks, too, for not only sharing your wonderful gardens with us but also sharing some of the nuts-and-bolts and costs. It really does help!! Beautiful. Lots of ideas to use. Thanks again. Hi Arden — Sorry you had trouble commenting earlier. To answer your question, my chive plant does get bigger (and better!) every year. I dig up and divide the plant every 3 years or so. The procedure keeps the plant within bounds! Thanks Kevin — I’ve never actively “divided” one (as I say, mine in Maine spread prolifically all on its own) and my one here in Utah is sure a bit lackadaisical for my taste. I’ll keep encouraging it, though! And thanks again for sorting out the commenting issue. I am pleased to report that I finally have my boxwood cuttings prepared and stuck into soil. Mine are variegated, however, and I hope they will behave the same way as your straight green ones. When I went to pick some lettuce this morning I was met with an ant swarm, using the lettuce leaves for climbing practice, nearly coating them. Probably something to do with last night’s deluge of rain washing away their nest. I will try again shortly. My arbor came off Craigslist for a mere $12, now coated with a small flowering dark purple Clematis. Keeping your eyes open (AND keeping your mind open to alternate possiblilities) can yield lots of good garden bargains. Thanks for your inspiring photos and advice. I have a lot of boxwood in my California garden and love the look it provides. Thank you so much for the boxwood cutting idea! When I first saw your boxwood post a few months ago, I decided to experiment with two pots of cuttings. They are doing so well that I want to start more. Since it is so hot here I am starting more cuttings in 4″ plastic recycled. I will keep them under shade and plant out in the garden come early fall. I have another location where I think more boxwood will look great. I love your website. Thank you for sharing with us. Love your column! Any suggestions for a huge harvest of flat leaf parsley? I have added some to my pesto recipes and I use it in my salads, on fish,etc.. Is there a cold soup recipe that you Know? Any suggestions would be appreciated. I join your fan club for both garden and kitchen. Love your ideas and use of “found” or cleverly purchased items. My daughter-in-law has the same outlook and so do I. She found lovely garden chairs on Kijiji and dragged a neighbour’s cast off picnic table home to use with a sun umbrella she bought on sale at Target and found inexpensive chair cushions to pick up the colour of the umbrella. She is doing a wonderful job with their new yard and gardens – another smart cookie (like you). Love your recipes and tips, all presented with humour, making them a joy to read. Your newsletter is so much fun and so relaxing, while being filled with valuable information. I also love to see what challenges and triumphs others face. Thanks for knitting together a gardening/cooking family for all of us to share. Pets to Lily. Congrats to you and partner. More on boxwood cuttings–Dianne and I have similar questions, which I hope you will answer soon–at what point do you move the boxwood cuttings out of the herb garden? And where do you move them to–their final planting spot or another temporary bed? Two years (!) ago I started some boxwood cuttings in a 4″ pot and although they survived and rooted, they did not grow much, if at all. About a month ago, we transplanted one into where we hope its final spot will be (it was not rootbound at all). But it is only about 5″ tall, and looks soooo small compared to the surrounding plants. Had to put a wire cage (an empty upside-down hanging basket) over it to prevent critters (human and otherwise) from walking on it. Your kitchen garden/herb garden is beautiful and I really appreciate your ideas for “decorating rich even when you’re not”! Do you have any advice on the best way to use this vegetable, Kevin? I need all the help I can get with this one. 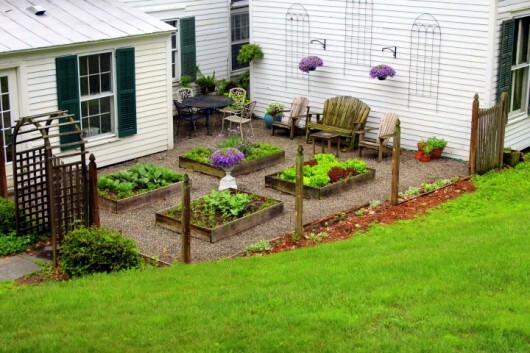 Wonderful post, as always–your raised beds are spectacular. Theuret’s are doing great. Time to put the crushed egg shells around to heed off blossom end rot. I always plant clumps of basil between the tomatoes to keep away the hornworms. I gave a friend some Theuret’s and he gave seeds to a friend of his who has a greenhouse and raised 72! Apparently he is selling them at our Saturday downtown Bloomington Farmer’s Market. Love it! I plan to try some of your ideas. Diane and Sara – The nice thing about boxwood? It can be pruned to any size you desire. Those in the herb garden will be kept small, so they can frame the beds without overwhelming them. Well, that’s the plan! Love your garden design and ideas. I’ve already decided where I’ll hang the trellises in my own garden and where I’ll use the fencing, posts, and gates. Thanks for sharing all the great ideas that we can use in our own gardens! I’m in Central Florida. 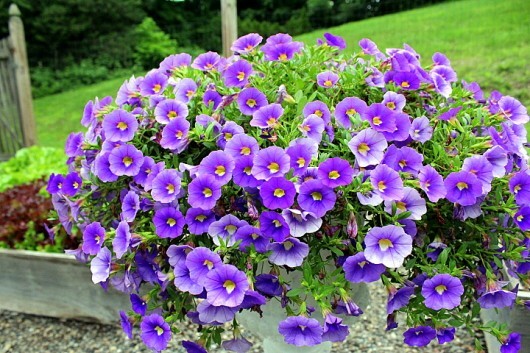 I want to obtain-Callie,’ a lavender-blue Calibrachoa. Where can I get this plant or seeds? Thank you. I enjoy your site. I’m addicted to Plants!!! Thanks for sharing again! Hot Florida does not like your type of garden now. 🙁 But gearing up for the fall,winter and spring! Thank you for being so special, Kevin! I love your blog and enjoyed visiting your beautiful gardens last year. Since you have an adored dog I hope you have a suggestion for deterring a similarly adored dog who has developed a strong fondness for the blood meal I use around plants to deter my many rabbits from devouring the plants. Where did you manage to snag a cedar arch for 50$? You said to time it to Sep. when garden centers are clearing out existing merchandise to make way for holiday decorations. The cookie-berry- cream cheese frosting dessert was an enormous, well, 10 inch success at Fathers’ Day celebration. In fact, requested for Fourth of July. Thanks from one who believes food must be pretty, if not gorgeous. 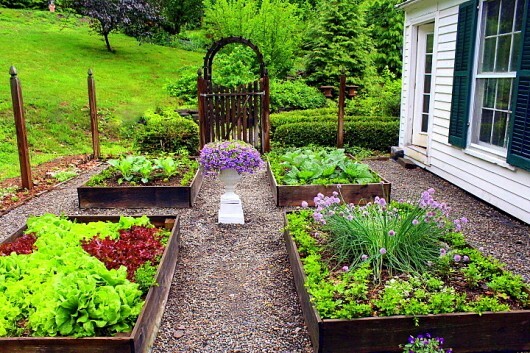 Your garden looks like a million bucks!! You are very creative!! What a diference a garden makes! Fabulous. This really was very pretty and inspiring. Very nice pictures. When you post things you do make projects or recipes attainable to all. I am making your lavender shortbread cookies for a friend. THANK YOU for the encouragement. I have a knack for finding the most expensive way to do anything! I am back in Duncanville, I will stay in this house this year. 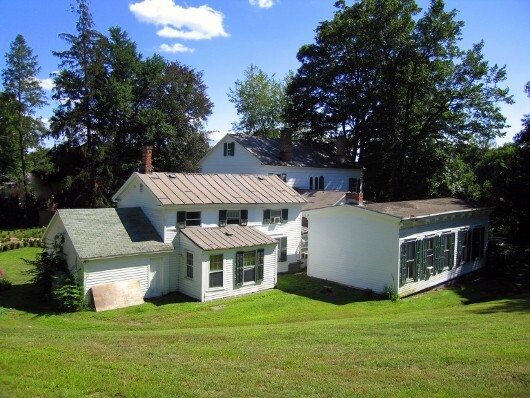 In May 2016 I will begin to look for a house I can live in for a while. Having step by step instructions on how to to it with so little expense is a HUGE help. Your home is an oasis. To know how to CREATE such elsewhere is gives me the encouragement I need to keep on moving ahead! NOW what do I do for 9 months on a back patio! Where the neighbor’s dog runs wild! I really love this post of how to make a lovely herb/house garden area on a budget. Too many times people think you need tons of money to do a project. Instead doing it in steps and over a little time can make a beautiful area. Great price on that arched gateway! Thanks for all the wonderful posts you share with us. And thank you for posting some gluten free recipes. With multiple food allergies in our home finding gf recipes with beautiful pictures is very inspiring and I have made most of the ones you have posted. Kevin, I’m so glad I found you ! Love your home, your receipies , your garden. Beautiful! You are an inspiration to me’. Thank you. I have always enjoyed seeing photos of this wonderful garden. It has been the inspiration for me at my former home. I really want to see it in person, one of these years. LOVE the start to finish views! They are SO INSPIRING ! Good job frugal gardener! You never fail to inspire me with your garden ideas! Recipes good too! Look forward to your postings. Can butter be made in a blender? At age 93 I thought I had given up needing a food processor but thanks to you – I may have to buy one. Too many tempting recipes. I just LOVE before and after photos. Thank you for this one! Just curious. What kind of critters do you have there that would eat your goodies if you didn’t have the wire mesh fencing? After 28 years in our present home (in Northeast Ohio) the deer finally found us year before last and they have nibbled almost everything we have, year round. Oh well, we are learning to co -exist and may have to resort to fencing soon. Hi Brenda Treants – Welcome back! Hi Sarah Corson – Why, thank you! Hi Robin in Seattle – Such a shame that I did not own a camera when most of my gardens were made. Sheer luck to find the “before” photo up top! Hi Nancy J – All kinds of nibbling creatures here — deer, rabbits, and woodchucks, to name just three. Like you, I try to co-exist with them. I really appreciate how you show ways of doing things on a budget. Beauty isn’t dependent on having a lot of money and you offer such good ideas. Thanks! Kevin! What is the old kitchen wing used for now that it’s no longer your kitchen?? I just love old houses!! And your site and your recipes! I “adore” your herb garden, but now that I have moved and live in a Senior Community complex, I don’t have room for one, but I’m thinking about doing some pots on my back patio. At the very least some Basil, Cilantro, Sage, and Oregano and a couple of tomato plants to use them with! 🙂 Happy Spring! Are you still growing cabbage? Hi Debra – Several years ago, I turned the old kitchen wing into guest quarters. The wing also serves as a giant closet for the 2, 087, 542 plates, bowls, and platters that I use for food photography! Hi Doris – Absolutely! And every month or so, I make your roasted cabbage rounds! Ever since I asked you for advise about African Violet’s I have waited for you email every week. I love gardening but live in Florida and sorry but I miss my Hydrengas and all the beautiful flowers from up north. Your blog makes me happy and I love it and your respites. Also. Keep up your happy work. 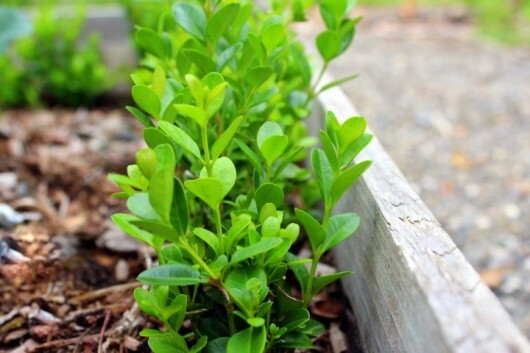 Can you explain how to grow cuttings from boxwood for the herb garden? Thank you for sharing your home and garden with all of us! Hi Phyllis – Under the 14th photo, click the link that says “Click here for more details.” You’ll be directed to my boxwood-propagating how-to. The calibrachoa and supertunias are gorgeous: understated and elegant. Great design! I just moved to zone 5 from zone 8 so I’ll be watching your blog with special interest now that I have to deal with THE COLD. Your posts are inspirational. Love the b4 and after garden turn-around. Greetings Kevin – your emails are the first I open every week with a Yay – either great ideas, warm heart vibes or the best recipes. Now, my confession. I was always jealous of you, saying ‘oh sure, SHE can blog from this gorgeous and expansive Victorian estate of long pathways and huge gardens and music rooms etc – while I’ve got only this city lot and a small 749 sq ft wartime house on the windy prairies of Saskatchewan. Blush. Okay, I’ve followed many of your ideas and birthed my own and voila! I have yummy smells in my kitchen. I built a Wellness Center out of donated materials with a sauna in it, a back stretching machine and vibration machine with vinyl flooring and fireplaces. Plus I build a 10×10 garden shed for my ‘gardening stuff’ being an organic food and flower-growing gardener (20 flowerbeds) AND I built a 16’x9.5′ greenhouse where I wintered over my flowers (soon to be set out to refresh in the sun) and currently have lettuces, spinach, chard and much more growing for fresh food… I have wooden walkways all thruout the yard, victorian lampposts for evening lighting and this is all to say – THANKS FOR THE INSPIRATIONAL POSTS!!!!! I make you an honorary member of the Clan of Beauty and await your next entertaining ideas. me? I’m off to do some winter-sowing for my outdoor food gardens. Lu (and oh – supertunias it will be this year hanging from about 9 different coir hanging baskets)!!!!!!! Thanks for sharing the sights of your garden on a windy March day! Kevin, How often do you trim the boxwoods to keep them so neat?? I’m in the process of designing a permaculture garden in Spain and came upon your post in the Garden Design website. Your ‘garden philosophy’ of framing and other design tips are very helpful. 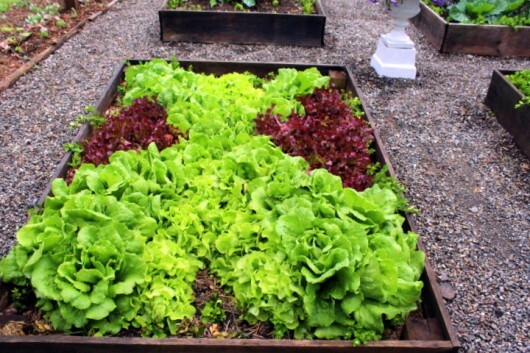 Lawn to lettuce is a wonderful thing – no more mowing just good eating. Kevin: Gorgeous garden- it does look very chic & costly heehee. Question- what kind of sun do get there? Looks like major direct sun? I love your vision and envy your energy. 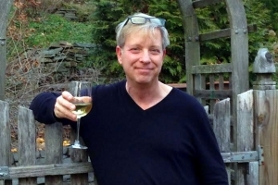 I look forward to your emails with your fabulous recipes and fantastic gardening designs ! You are a talented maestro!! Love all your tours of your house! You’ve done a fabulous job of remodeling (esp. kitchen) and decorating. Enjoyed the old pictures also. Do enjoy getting your recipes and gardening hints! Keep up the good work! Kevin, I missed the first go-around of these posts but your timing now couldn’t be better. Living in Minnesota with seemingly endless snow and cold, I needed a diversion – and inspiration for when the weather is more cooperative. thanks for the encouragement. I have two boxes, trying to figure out how to balance them along with the neighbor’s yard and all the garden supplies sitting nearby. Will try again. If you can do it, so can I! It is -25 today in my spot of Canada. Kevin, thank you for always having perfect timing! You keep me from going entirely berserk and for that, I am truly thankful. Your humour, hard work and eye for beauty save the day, every single time. Blessings. Just stumbled upon your site. A serendipity! Thank you, Kevin Lee. Super Duper! It is really beautiful! and, Your story (almost) motivates even me to garden. Thank you, Kevin, for your story today! 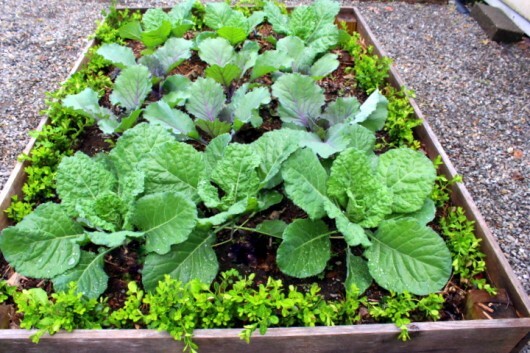 I love ‘raised beds’. Makes gardening so much easier. Thanks for your help in planning them. Kevin, your posts are all wonderfully done and so enjoyable! You are truly an inspiration to all of us! Thank you for your generosity in sharing your beautiful home, gardens and ideas. I never thought of going to auctions for garden items. The urn adds that special touch and the purple flowers are beautifully bright against the white and green surroundings. Even though we still have lots of snow here in upstate NY, we can begin to think spring and plan gardens. Thank you for the great garden ideas you have inspired me with over the last year! Any thoughts on how to keep squirrels and chipmunks out of the garden and still have it look attractive. Your garden looks so neat and tidy but that will only keep the wild rabbits out for us. What an absolutely stunning transformation, Kevin!! Your home is just glorious, and your gardens divine!